Suisun Creek watershed drains 53 square miles in Napa and Solano counties, from the western flank of the Vaca Mountains to Suisun Marsh. 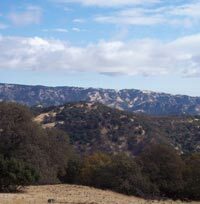 Over ninety percent of the watershed is open space, and most of it is privately owned by farmers and ranchers. The lack of development in the watershed has preserved ample habitat for wildlife, including steelhead trout (Oncorhynchus mykiss). Recent studies have named Suisun Creek as one of 8 “anchor” watersheds in the Bay area supporting steelhead trout habitat. Some long-time residents say that trout used to be so plentiful 40-50 years ago that they would spear the fish out of the stream with a pitchfork. 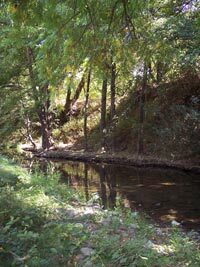 Suisun Creek derives its name from the Suisun or Suisunes people of the Patwin Indians, who lived in the area at the time of the arrival of the Spanish. Gordon Valley Dam was constructed on Suisun Creek by the City of Vallejo in 1926 for water supply. Wooden Valley Creek and its tributary, White Creek, drains a small agricultural valley and large area of wildlands to meet Suisun Creek several miles downstream of the dam. Ledgewood Creek drains approximately 21 square miles along the eastern side of Suisun Valley to Suisun Marsh. 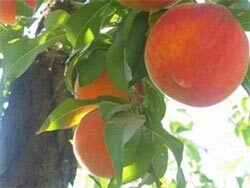 In the early 20th century, Suisun Valley was a significant producer of stone fruits, including cherries, peaches, and apricots; grapes, walnuts, pears, prunes, and cattle were also shipped to markets in the Bay area and beyond. 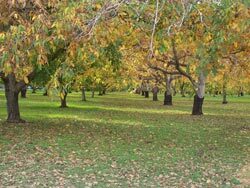 The cherries from this area were the first to arrive in winter-weary eastern cities; thus fruit from Suisun was highly desirable. Suisun Slough, the tidal area of Suisun Creek, had a port for shipping fruit and for oil tankers. 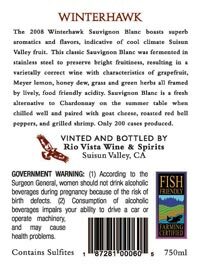 The Suisun Valley Fruit Growers Association was founded in 1920. After World War I, 15-20 packing sheds operated in Suisun Valley, and 45,000 tons of pears per year were shipped out of the valley. Over the past 40 years, agriculture in Suisun Valley has shifted away from pears and other fruits and toward wine grapes. Grapes made a comeback after Prohibition when phylloxera-resistant rootstock was developed. 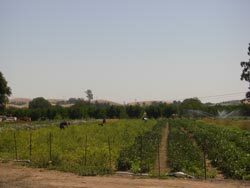 Nevertheless, a wide variety of crops are still grown in the valley, including tomatoes, strawberries, kiwi fruit, kumquats, and garbanzo beans, in addition to prunes, walnuts, pears, and stone fruits. The Suisun Creek Watershed Program began in 2002 as a collaboration between landowners, the California Sportfishing Protection Alliance, Laurel Marcus & Associates, the City of Vallejo, National Marine Fisheries Service, and the Regional Water Quality Control Board and produced a watershed plan in 2004. 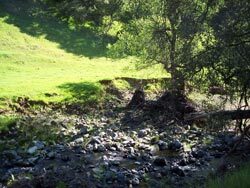 CLSI now directs implementation of the watershed plan through the Fish Friendly Farming program and a grant through the Department of Conservation for a Suisun Creek Watershed Coordinator. 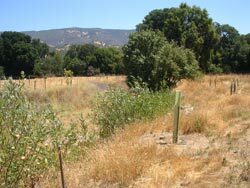 Implementation actions include Arundo donax eradication and revegetation of Suisun Creek, revegetation of lower Wooden Valley Creek and upper White Creek, and extensive water quality and temperature monitoring. Arundo donax is interspersed in the riparian corridor of Suisun Creek and is being removed by CLSI starting at the Gordon Valley Dam and moving downstream. 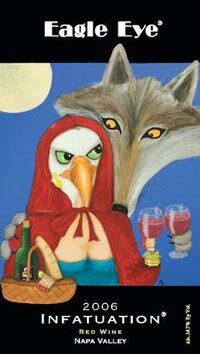 Bill and Roxanne Wolf developed a 13-acre vineyard and olive orchard along Suisun Creek in 1999. The riparian corridor is particularly wide at this site. Invasive, non-native Himalayan blackberry and blue periwinkle has been removed from the corridor and replaced with native oaks, maples, and willows. Derrick Lum farms 600 acres throughout Suisun Valley, growing a diverse array of crops including sunflowers, garbanzo beans, walnuts, yellow beans, prunes, persimmons, and sorghum. Crops are rotated to encourage soil nutrients and improvement of soil structure. Derrick is also working with FFF staff to formulate a strategy for removing Arundo donax on Ledgewood Creek on his property. This 16-acre site borders Suisun Creek, where the current owners, Rory and Bruce Dorrough, grew up playing and watching steelhead trout swim upstream to spawn. The Dorroughs have been actively involved in efforts to increase the threatened trout population on Suisun Creek, and completed a stream bank revegetation project with the FFF program. Ray Erickson is a 3rd generation farmer in Suisun Valley and owns and operates Erickson Ranch, including a popular produce stand and dahlia garden, on lower Suisun Creek. He grows pears, nectarines, peaches, apricots, plums, cherries, apples, corn, and tomatoes, as well as flowers. 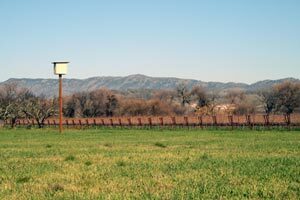 Erickson leaves a dense cover crop in the orchard and on orchard roads to minimize soil erosion, and leaves a wide corridor between the creek and his crops to provide wildlife habitat; he also has installed bat boxes in his barn. 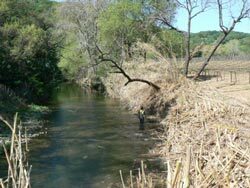 The FFF program has removed invasive, non-native Arundo donax from the stream corridor and seeded a thick filter strip between the orchard and creek to minimize sheet erosion and runoff to the creek. 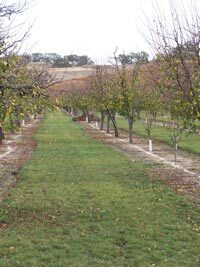 Vineyards were planted on this former pear orchard in the 1980s and 1990s. 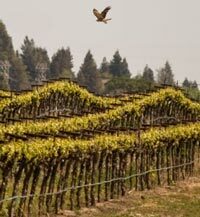 The Frisbie family owns and manages the vineyards with site-specific cover crops to minimize soil erosion and provide nutrients to the soil. Ledgewood Creek, which runs along the property boundary, is being managed to remove invasive non-native plants and allow the creek channel to stabilize naturally. Dan McQueeney is a 5th generation owner and cattle rancher of this 1115-acre site. Dan has installed electric fencing along Wooden Valley Creek to allow regeneration of native willows and mulefat, and is working with the FFF program to revegetate 1.25 miles of the creek. Only 70 acres of vineyard are farmed on this 1150-acre site that stretches from Lake Curry to Wooden Valley. Rancho Chimiles bears the name of the original Spanish land grant of 1859, and has been used for rangeland, prune orchards, and oat hay prior to vineyards for the past 100 years or more. Owner Terry Wilson and his son Dave manage the vineyards to minimize impact on the ephemeral streams that run through the property. 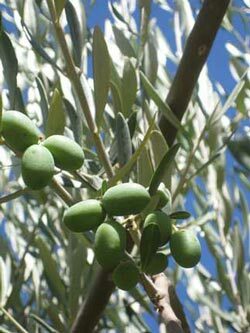 This 15-acre olive orchard is farmed organically with IPM methods to minimize pesticide use. The olive oil produced from this orchard has won several awards. This 100-acre site has a small vineyard on a hillside above Suisun Creek. Dan and Marguerite Capp manage this 211-acre site which borders lower Wooden Valley Creek and Suisun Creek. Both creeks are lined with a diverse riparian corridor and support steelhead trout spawning and rearing. The Capps were founding members of the Suisun Creek Restoration Team and have hosted monitoring studies and projects to restore riparian and aquatic habitats. Arundo donax has been removed and the riparian corridor revegetated on this site as part of the Suisun Creek Invasive Non-Native Arundo Removal and Native Plant Revegetation Project (link). The vineyards are managed for limited chemical input. This 110-acre vineyard in the Ledgewood Creek drainage is nestled between sites owned by Ledgewood Creek Vineyards and was once a pear orchard. 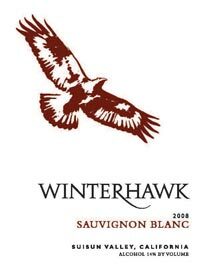 Winterhawk Winery’s Sauvignon blanc, produced from grapes grown on this site, has the distinction of being the first wine in the country to put the FFF logo on its label.